It's been a really long day...port accessed...check (did awesome), peripheral line in her arm...check (cried, they got it on first time, did awesome), GM-CSF shot...check (did awesome)! Been pretty emotional day, but we are so proud of her! Now the day has really just started with the CH14.18 just starting! Please hope for no pain and she handles this well! This will run til 245am! Thank you to Elaine, Emily's nurse from the clinic. As we were coming into the hospital, Emily asked if she could go to the clinic to be accessed, and I told her we had to go to the 7th floor, and she was upset, because she wanted Elaine to access her. I get a call a few minutes later while checking in, that she was going to come up and access Emily. Thank you Elaine, this really made it much easier on Emily. We are so thankful that they were able to get the line in her arm with no problem, because if there were any problems, we would have had to make other decisions on what to do. 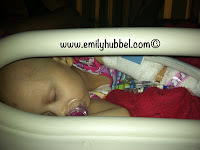 We feel this is the best decision to make Emily the happiness when she is not in treatment. I was pretty nervous about how it was going to go remembering how she did when she was diagnosed, but Dad was pretty confident she would do fine. Emily did great, and we are so proud of her. Its has been a long evening and the CH14.18 runs until 245AM and the morphine will run until 445AM. She had a nasty bout of pain, heart rate increasing and they had to get approval for a bolus of morphine. Upped the morphine and gave bolus and she settled down a bit. Pretty emotional for dad and I watching her in so much pain, crying out and moving around so much because it hurt so much and there was nothing that we could really do, just trying to help calm her. About half hour ago, she said it was hurting a little bit, but it was time for her benadryl so right now she is settled and sleeping, hopefully the rest of the evening will be ok for her and she will handle it. 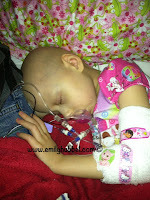 Please continue to send your thoughts and love for her to handle the rest of the transfusion tonight. I will update later to let you guys know how the rest of the evening goes. There have been doctors, nurses and others in and out today, lots of filling out of paperwork and taking care of things.. Thank you to Sue for spending the day here with me, I can't tell you much it mean to Doug and I for you to be here with me and just be there to help out, it really meant so much. The nurse practioner came in and talked about the accutane that Emily will need to take, and said that Emily will have to undergo a pregnancy test for each time we need to get the accutane. I said, "Are you kidding me?" She said she was shocked too, but it was required. Daddy and I are so proud of Emily. Praying and praying for you Emily. Father cuddle Emily tonight. Let her rest peacefully in Your strong arms. Let her feel Your healing breath on her neck and let Your healing touch remove this cancer completely from her body never to surface again. Bless mom and dad and let them feel Your peace surround them. In the name of Jesus amen. Today , at my job, I had a woman give me a bracelet for you emily. I want you to know you are in my prayers, god is always with you and will give you the strength to fight this. I will always wear this bracelet and will send your message on. Stay strong , and know god is always with you.